B2B buyers are increasingly dumping sales staff interactions for online research and purchasing but find suppliers websites less than helpful sources of information, a new report claims. The Acquity Group’s annual State of B2B Procurement study of 500 buyers in organisations across the US found 68 per cent are now purchasing goods online, up from 57 per cent last year. Forty-four per cent are researching products on a smartphone or tablet, a figure which rises to 55 per cent for workers aged between 18 and 25 years. The number of respondents who spent at least 90 per cent of their budget online also doubled year-on-year to 18 per cent. Despite this, less than half of buyers said they purchased goods directly from a supplier online, indicating a gap between customer demand and online supplier offerings. The report also found procurement team are spending longer researching goods prior to purchase. For example, 40 per cent of buyers said they research more than half of goods valued at less than $10,000 online, while 31 per cent research goods valued at $100,000 or more online. For corporate purchases of $5000 or more, 34 per cent said they spent more than three hours researching before making a purchase. Price comparison is also rife across a wide variety of sites. On the list of the most popular sources are a supplier’s website (83.4 per cent), Google search (77 per cent), user product reviews (41.8 per cent), blogs (10.8 per cent), social media (8.6 per cent) and third-party supplier sites (34 per cent). The report authors noted that while a supplier’s website is the most popular channel for conducting research online, only 37 per cent of B2B buyers who conducted research in this fashion said they found these sites to be the most helpful source of information. As an example, only 3 per cent of procurement officers this year said their suppliers lack online catalogues, compared with 11 per cent last year. 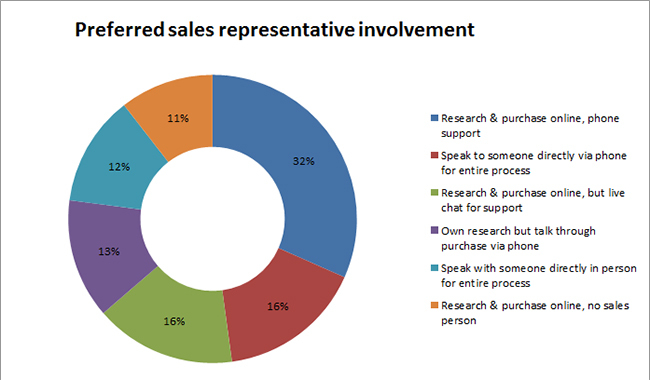 And in a worrying sign for B2B sales forces, only 12 per cent of survey respondents said they want to meet in person with a sales presentation, and 71 per cent prefer to conduct research and purchase on their own with access to a sales person via the phone or online chat when need. “B2B organisations must empower their customers to browse, research and purchase products with ease through any medium, while also finding the support they need through any channel,” the report authors stated. Related: Is B2B marketing boring? The good news for those with a strong digital presence is that 71 per cent of buyers will switch suppliers if the overall digital experience is better with a competitive organisation, and 53 per cent will switch suppliers for an easier electronic search process. “The key for B2B organisations is to transform their customer’s online journey into an omni-channel experience that emphasises digital channels, especially since younger, tech-savvy generations will soon make up the majority of corporate procurement departments,” the report stated. Acquity Group is a ecommerce and digital marketing agency and was acquired by Accenture Interactive last July.